Smiling Gums is a band with roots found deep within the origins of rock and roll. The music provides a narrative quality advising on how to approach a deeper understanding of the world around us. Hidden between these messages one finds a musical component taking one on a trip that covers both deep moods and violent flurries of energy. Smiling Gums has a powerful stage show, where intertwining bass and guitar melodies are coupled with a moody organ, running drums and congas. Smiling Gums will take you through the past of rock and into the future of music. Based out of Miami, Florida they roam the grounds of Studio A, Revolver, Soho Lounge, Hard Rock Cafe, Tobacco Road, Titanic, and Bullfrog Eatz to name a few. Over the past five years the band has worked closely with the Daily Bread Food Bank of South Florida by organizing and performing at events to benefit the organization. Through events like "Come Together" at the Margulies Warehouse and "Taste of the Nation" by Share our Strength, as well as several benefit concerts, the band has helped raise over $400,00 for the Daily Bread Food Bank of South Florida, which represents over $2,400,000 meals for the hungry. Smiling Gums recently took off on an 32 show East Coast Tour of the U.S.
Loop Lounge, and Dt's Underground to name a few. 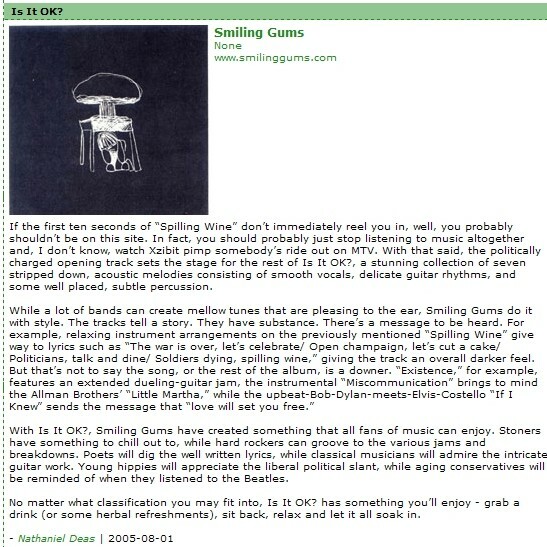 The following article is a review of one of Smiling Gums three albums.